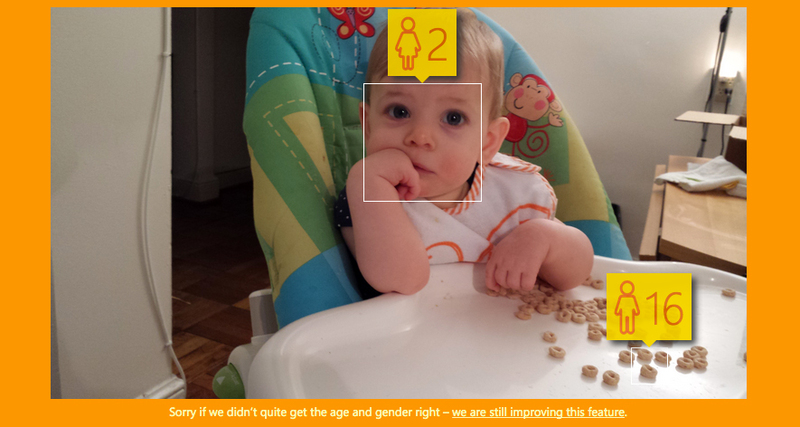 Time has apparently not been kind at all to those Cheerios… and the baby didn’t need the extra year of aging, either. If you use Facebook, Twitter, or basically any part of the internet at all, sometime in the last 24 hours you’ve seen Microsoft’s newest tool, the age-guesser. Everyone’s sharing it, using it, and laughing over (or feeling insulted by) the results. But the tool’s rapid spread also accidentally highlights one of the biggest challenges of the digital age: the fine print. The tool, How-Old.net, has gone viral very fast because of how hilariously wrong it often is. The world-weary baby at the top of this post, for example, was 9 months old when the picture was taken, which isn’t too far off — but the Cheerios on her tray were neither sixteen, male, nor in fact human at all. Plug in fictional characters or politicians, and the results are jokes that basically write themselves. In other words: Microsoft now maintains the rights to use any image you uploaded in basically any way they want. And that “public performance” bit is basically an out that prevents you from suing on copyright grounds if they do. Are your dog, best friend, grandma, U.S. representative, worst nightmare, favorite baseball player, kid, cat, and Cheerios likely to end up being used in demos, ads, or other products? No, not really. Microsoft has gotten tens or hundreds of thousands of pictures submitted, and, frankly, they can afford better promotional images from real photographers when they need a pic or two. And given how quickly the page was thrown together, and how chancy the lightning strike of viral fame can be, it’s unlikely at best that the tech giant actually meant the service to be a giant free photo collection tool. But the fine print should be a reminder to all of us: when it comes to data and privacy, the devil is indeed in the details.